In a major development, the government today gave a strong indication that the CBI would examine the fresh ‘evidence’ provided by Janata Party president Subramanian Swamy on the alleged involvement of Home Minister P Chidambaram in the 2007-08 2G Spectrum scam in his capacity as the then Finance Minister. As the protesters formally ended their 12-day fast against the Koodankulam Nuclear Power Project, the Tamil Nadu government today urged Prime Minister Manmohan Singh to suspend work at the project till the people's fears are allayed. The Gurdwara Election Commission (GEC) today failed to notify the results of the Shiromani Gurdwara Parbandhak Committee (SGPC) elections held on September 18 as it did not receive results from all constituencies. Tata’s ambitious plans of raising skyscrapers in the vicinity of Chandigarh have been grounded, at least for another two-and-a-half months. The Supreme Court today said that Vault B of the Sree Padmanabhaswamy Temple in Kerala should be opened only after the invaluable artifacts and jewels found in the other ‘kallaras’ had been properly documented and preserved. The Bench would hear the case again after three months. Even as most of the media focus has been on Manang in north Sikkim that is said to be the worst affected in Sunday's earthquake, there are around 400 people still stuck in villages beyond where rescue workers are still struggling to reach, a relief coordinator said. Even as the Prime Minister’s Office expressed concern over the latest outbreak of bird flu in West Bengal and sought utmost caution, the Health Ministry today deputed a Central team to monitor its consequences on human health. Avian influenza, or bird flu, is caused by Influenza A virus that has many sub-types. Amid the raging controversy over the Planning Commission affidavit on Below Poverty Line (BPL) cap, Rural Development Minister Jairam Ramesh has written to commission Deputy Chairman Montek Singh Ahluwalia, questioning the current methodology. “The new documents filed for the first time before this Hon’ble Court will naturally be studied and considered by the CBI as usual and may be covered in the next status report,” Centre’s senior counsel PP Rao said in his written submissions. However, the written submissions are yet to be given to the Bench comprising Justices GS Singhvi and AK Ganguly which is hearing the case. “Further, after filing the initial probe report, if the investigating officer obtained or received further evidence, he is under a duty to forward further report or reports to the court as the case may be,” Rao reasoned. In the written submissions, Rao also explained that Section 173(8) of the CrPC pertaining to holding further investigation “confers a power which is coupled with duty.” In his oral arguments before the Bench, Rao pleaded with the court not to pass any order on Swamy’s application for directing the CBI to investigate Chidambaram’s possible involvement. Yesterday, Swamy had submitted to the Bench copies of a March 25, 2011 correspondence from the Finance Ministry to the Prime Minister’s Office (PMO) which showed that Chidambaram could have prevented the scam. Swamy said this document had strengthened his plea against Chidambaram. While the government and the CBI were united in opposing Swamy’s plea, they took diametrically opposite stands on the question of continued monitoring of the CBI investigations into the case by the apex court. Appearing for the CBI, senior counsel KK Venugopal said his client would like the “monitoring to continue” in matters where investigations were still on in the case. Rao said he was “surprised” by the probe agency’s submission for continued SC monitoring. “Investigations are on in regard to two other complaints,” Venugopal responded. In its order, the Bench recorded the CBI’s readiness for continued SC monitoring. The arguments would continue on September 27. A meeting of the Cabinet, chaired by Chief Minister Jayalalithaa, passed a resolution requesting the Prime Minister and the Centre to halt the work at the project until the apprehensions of the people were allayed, a promise that resulted in the resolution of the impasse at Koodankulam. Earlier in the day, 127 protesters broke their fast accepting a glass of juice each from their supporters here. During the meeting with a delegation of core group of protesters, Jayalalithaa had also assured them that she would talk to Manmohan Singh on his return from the USA on September 27. S P Udhaya Kumar, convener of People's Movement against Atomic Power, spearheading the stir, had announced withdrawal of the fast yesterday but said they would continue to keep the pressure on the Central Government to scrap the project, set to be commissioned in December. The Prime Minister had sent Minister of State in the PMO V Narayanasamy as his emissary to meet the protesters in Tirunelveli district after Jayalalithaa wrote to him on the issue. The Gurdwara Election Commission (GEC) today failed to notify the results of the Shiromani Gurdwara Parbandhak Committee (SGPC) elections held on September 18 as it did not receive results from all constituencies. The elections were held across Punjab, Haryana, Himachal Pradesh and Chandigarh. As per the election schedule, the results were to be declared and notified today. Though, the results have already been conveyed to the candidates at the constituency level, the same are to be compiled and notified by the commission before these attain finality. Justice HS Brar (retd) said the commission had sent a directive to all polling officers to intimate the commission about the results immediately. He said the notification process could take another two to three days. The results from about 80 constituencies in Punjab have been received so far. Most results from the other three states have also been received. But the notification process cannot be started till results from all 120 constituencies (some with double seats) from where 170 candidates have been elected are received. The failure to declare and notify the results could in turn delay the constitution of the general house and election of the president. Shiromani Akali Dal (SAD) president Sukhbir Singh Badal is going to Iran on September 25 and will return in the first week of October, so many decisions like who to include in the list of 15 members that are to be co-opted into the general house, etc can also be delayed. Meanwhile, Justice Brar today said he had so far not received any report into the inquiry ordered by him on September 19, pertaining to alleged bogus voting by non-Keshdharis. He today sent a reminder to the commissioners, gurdwara elections, to ask all deputy commissioners to submit their reports on the issue immediately. The GEC is upset at the lacklustre response of some officials involved in the election process. Many of them have failed to prove their commitment while dealing with work assigned by the commission. This is partly because the GEC does not have any punitive powers and has to depend on the state government and its machinery for the conduct of the elections. To begin with, some officials did not cooperate in the timely completion of voter lists, then many names were found missing when registered voter went to cast their votes. Further, the officials failed to comply with the commission’s directive to allow only Keshdhari voters to vote. And finally, they failed to submit the results on schedule, thus delaying the notification process. A Division Bench of the Punjab and Haryana High Court today directed continuation of the stay on the Tata Camelot Housing Colony Project coming up in Punjab’s Kansal village. The directions by the Bench of Acting Chief Justice MM Kumar and Justice Gurdev Singh came today morning during the hearing of public interest litigations, including the one filed by Punjab and Haryana High Court advocate Aalok Jagga. His counsel, DS Patwalia had earlier sought directions to Tata, the State of Punjab and other respondents to maintain status quo in the matter. Directing the continuation of the stay orders, the Bench also admitted the petition and fixed December 7 as the next date of hearing. Stating that his client had requisite permissions for carrying out the housing project, the counsel for Camelot sought directions for vacation of the stay, but his request failed to find favour with the Bench. The judges were of the apparent view that the matter required consideration for regular hearing. Patwalia also told the Bench that the process had begun to prepare a composite Master Plan for the periphery and that the issue would have a direct bearing on the case. The directions putting on hold the project were initially issued on January 20. The Bench of Chief Justice Ranjan Gogoi and Justice Augustine George Masih, in fact, ordered a stay on the booking, selling and construction of the Tata Camelot Housing Colony project. Taking suo motu cognizance of the 35-storey structure’s construction in the Capitol Complex’s vicinity, the high court had on November 15 last ruled that it revealed a “disturbing state of rapid and unregulated urbanisation”. Justice Ajay Tewari had then asserted the coming up of the structure was all the more disturbing as the high court was monitoring Chandigarh’s Master Plan preparation. The issue was brought to the high court’s notice through a news report that said as many as nine residential towers, between 12 and 35 storey, were all set to dot the UT skyline once construction of the Tata Camelot project commences. A Bench comprising Justices RV Raveendran and AK Patnaik also turned down an expert committee plea for entrusting the temple’s security with the Central paramilitary forces. It was for the state government to provide adequate security for protecting the treasure, it clarified. The temple management should pay Rs 25 lakh a year for preserving the assets and for security arrangements, while the state government should pitch in with the additional amount required for such purposes, the Bench said. The five-member expert committee had been appointed by the court on July 21 to supervise the temple’s documentation and preservation work. Even as most of the media focus has been on Manang in north Sikkim that is said to be the worst affected in Sunday's earthquake, there are around 400 people still stuck in villages beyond where rescue workers are still struggling to reach, a relief coordinator said. Nearly four days after the quake, rescue operation is still on. 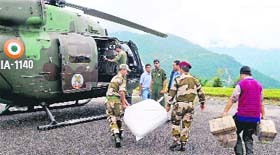 However rain and landslides have been acting as hurdles in the process and several places in north Sikkim - the worst affected - are still cut off. “There are at least three villages beyond Manang which are still cut off after the earthquake and at least 300-400 people are in those villages,” BB Rai of the Voluntary Health Association of Sikkim (VHAS), said. The most virulent of these are highly pathogenic avian influenza viruses that take little time to reach epidemic levels among birds. Of these sub-types, H5 (detected in Bengal), and more particularly subtype H5N1, pose the greatest concern for human health with the WHO repeatedly referring to evidence that H5N1 strain has a unique capacity to jump the species barrier and cause severe disease with high mortality in humans. Meanwhile, India is yet to determine the exact strain of the flu that broke out in West Bengal, with Chief of the Indian Council for Medical Research Dr VM Katoch admitting to The Tribune that “we have not yet seen the character of the strain. We are getting constant reports and our branches in the state are supporting animal husbandry staff culling chickens and destroying eggs to prevent the spread of the flu. We will gain knowledge of the nature of this strain soon”. “Relying on poverty estimates of the Planning Commission to arrive at cut-offs will not resolve the problem in any manner. There will have to be different cut-offs for different dimensions,” he said. He said there was a need to have different yardsticks to identify households for various schemes. He suggested an exclusion criteria saying “all non-excluded households be part of a main list with subsidiary lists for specific programmes”.